Enabling the use of daylight-balanced film under tungsten-lit conditions, this 105mm 80C Color Conversion Filter from Tiffen is a cooling filter used to increase the color temperature from 3800K to 5500K. The blue color of the filter has a filter factor of 2x, requiring an additional 1 stop of exposure to achieve normal results. 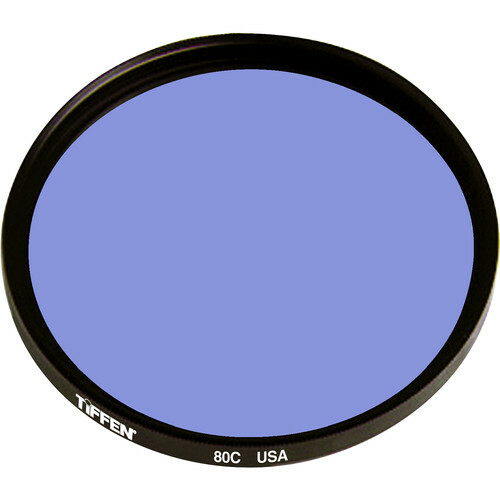 The filter is constructed using Tiffen's ColorCore technology, which involves lamenting the filter material between two pieces of optical glass, grounding flat to a tolerance of 1/10,000th of an inch, and mounting within an aluminum alloy ring. The coarse thread version of the filter has a thread pitch of 1.0. Blue color conversion filter increases color temperature and provides a cooling effect. Converts 3800K to 5500K for using daylight-balanced film under tungsten lighting. Filter factor of 2 requires approximately 1 stop of additional exposure to maintain normal results. ColorCore technology, which permanently laminates the filter material between two pieces of optical glass, maintains image clarity, accuracy, and consistency.